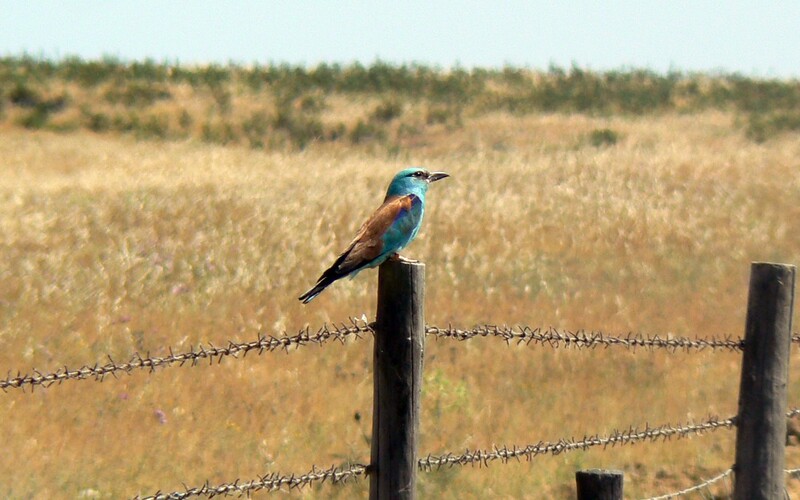 This last Spring Birdwatching Lisbon made several visits to the southern region of Alentejo to prepare a new tour mainly directed to the observation of steppe birds. Steppe areas and other interesting habitats (such as cork and holm oak woodlands, small and medium-sized dams, river valleys, rocky cliffs, etc.) were chosen to be part of this tour, which will mainly cover the Special Protection Area (SPA) of Castro Verde and the Guadiana Valley Nature Park. Target species of this tour (depending on the season) include Griffon Vulture, Black Vulture, Spanish Imperial Eagle, Bonelli’s Eagle, Montagu’s Harrier, Lesser Kestrel, Crane, Great Bustard, Little Bustard, Black-bellied Sandgrouse, Stone Curlew, Roller, Hoopoe, Bee-eater, Great Spotted Cuckoo, Crag Martin, Red-rumped Swallow, Rufous Bush Robin, Blue Rock Thrush, Black-eared Wheatear, Calandra Lark, Short-toed Lark, Thekla Lark, Azure-winged Magpie, Spanish Sparrow, amongst many others. This tour will be available all-year round (although Spring would be the best time) in two formats – 1 or 2 days-tour – and will be arranjed for individuals or small parties (up to six persons). Tours will depart and finish in Lisbon (Hotel pick-up and drop-off service included). To get the most of this tour we willl depart early in the morning and get back late in the afternoon. Full tour conditions are being prepared at the moment and will be availabe on our website, here. In the meanwhile you can send us a message for more information (on prices and conditions) on this particular tour, here.